I am quite sure that all you 1980s babies would have remembered the classic sci-fi film series, Back to the Future. There is nothing quite like the zany imagination from the past still keeping folks entertained today. I guess time travel is out of the question at the moment, and will be so in the immediate future, but how cool would it be to be able to travel through the fabric of space and time? 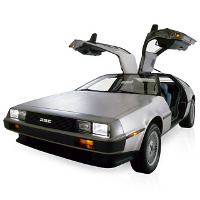 The DeLorean ended up as an iconic vehicle because of the movie, and you just got to love the gull wing doors. Well, the £70,000 Electric DeLorean DMCEV might be just the vehicle that you are looking for, although it might not prove to be the most affordable ride around. I guess in some way, it is really from the future since it is powered by electricity instead of gas. Boasting a top speed of 125mph, it will no doubt outperform its petrol-powered predecessor, hitting 0-60mph in just 4.9 seconds.